From his romp in the sand, Crown offers viewers advice on just what to bring for a quick beach getaway. Crown’s daytime attire is more typical of the beach, comprised of a lightweight button-up shirt and swimming trunks. There’s no tacky beach wear like we’ve unfortunately become used to seeing; no polyester Hawaiian shirts, novelty tees, or straw hats with frayed edges. The lightweight shirt is orange with six white buttons down a front placket. There are also two flapped chest pockets that close with buttons. This type of shirt is meant to be worn casually and has a split hem on each side for more comfort. It is long-sleeved, but Crown rolls the sleeves halfway up his forearm to go with his whole devil-may-care persona. Thomas Crown relaxes in style while on the beach. The large round gold St. Christopher medallion seen in the above photos is a McQueen standard, which he seemed to wear in most of his films on a thin gold chain, much like the silver ring that Robert Redford wears on his right hand in almost all of his movies. 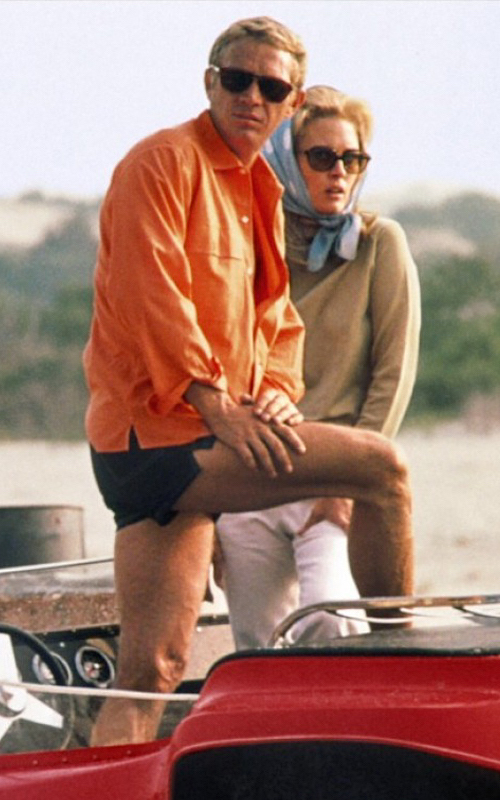 The swimming trunks, which may fall under modern criticism for their short inseam, are dark navy with white seams. They also have a very short split hem on each side. Evidently, she has little interest in actually going swimming. For the cooler evenings, Crown sports a classic cream-colored wool knit fisherman’s sweater. 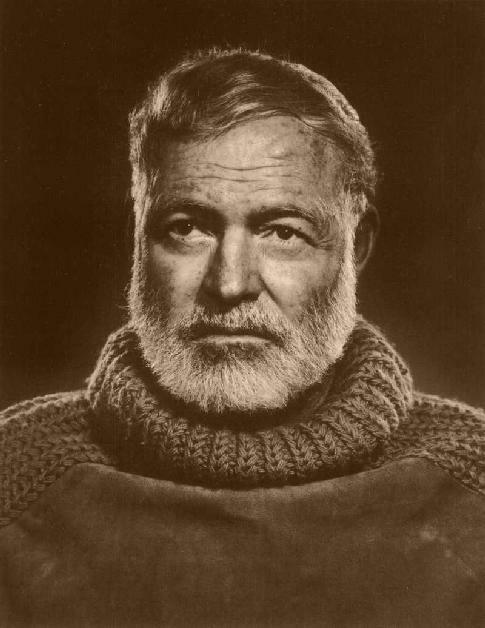 This type of sweater, known as an “Aran jumper” from the Aran Islands off of Ireland, is often associated with overly masculine types such as Hemingway. Sweaters like these are known for their bulk as well as their prominent cable patterns down the chest. Common patterns are often symbolic; the honeycomb signifies hard work, the cable wishes for safety and good luck for fishermen, the diamond wishes for success, and the basket stitch hopes for a plentiful catch. Since we don’t see Crown actually doing any fishing, perhaps the sweater is for safety and good luck while dunebuggying? Crown in the film and (inset) McQueen behind the camera. Same jacket? 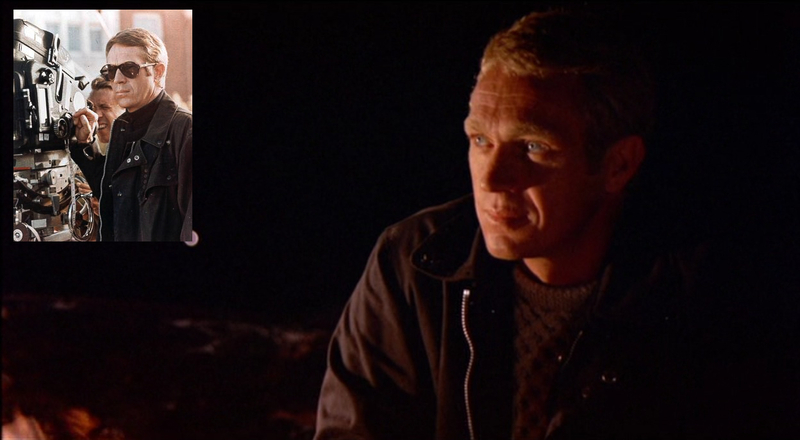 Crown’s jacket for the cool nights on the beach appeared at first – to me anyway – to be a dark canvas windbreaker, but a closer look determines that it is in fact a black leather motorcycle jacket, very appropriate for McQueen and likely his own personal jacket. 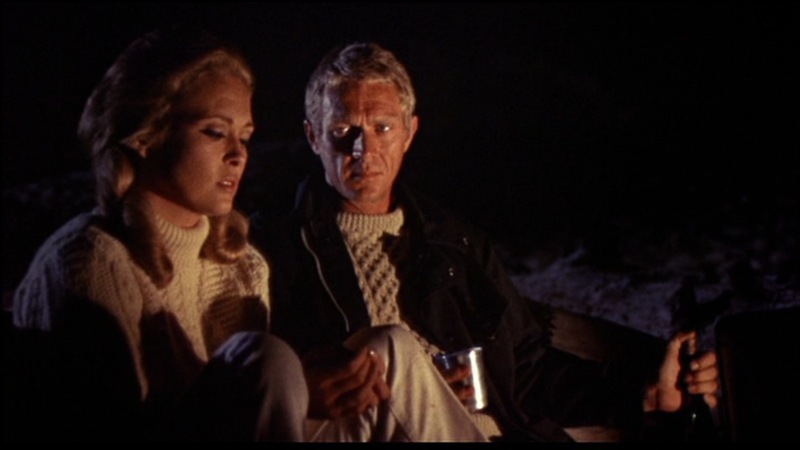 This is confirmed by matching up the zipper front, collar snaps, and buttons visible in the film to a behind-the-scenes photo of McQueen on set. Crown ditches the swimming shorts when not going in the water, instead wearing a pair of very light wash blue denim jeans. He also wears a plain dark navy blue fitted baseball cap with a curved brim. 1968’s version of The Thinker. Crown also wears his signature Persol 714 sunglasses with “Havana” tortoiseshell frames. However, these do not have the custom blue lenses as worn earlier in the film with his glen plaid three-piece suit. Instead, they have the stock brown faded lenses that are still offered on the Persol website as option code 24/31. 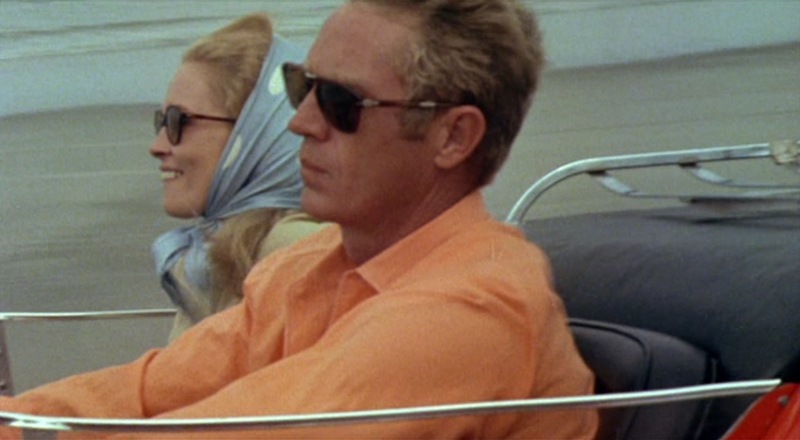 Boy, McQueen really always had to drive something in his movies, didn’t he? Crown’s buggy, which Steve McQueen reportedly helped to design, is a TCA buggy on a modified Meyers Manx body with an early Volkswagen chassis. It was built by Pete Condos and Eckley Turr at Conn-Ferr. A Corvair engine was installed in the rear, either 140 hp or 230 hp, depending on the source. The large racing tires were Firestone with extra-wide rear wheels cast specially by American racing. The engine adaptor was made by Ted Trevor and the transaxle was a swing-axle with a flipped ring and pinion. The interior was the work of Tony Nancy, using Datsun Fairlady seats and a flat aluminum plate for the dashboard. The buggy in the film used the flat tonneau cover with a luggage rack, but two covers were made. Most of this information was in the April 2005 issue of Kit Car Builder Magazine as well as McQueen Online, a great site dedicated to the actor. 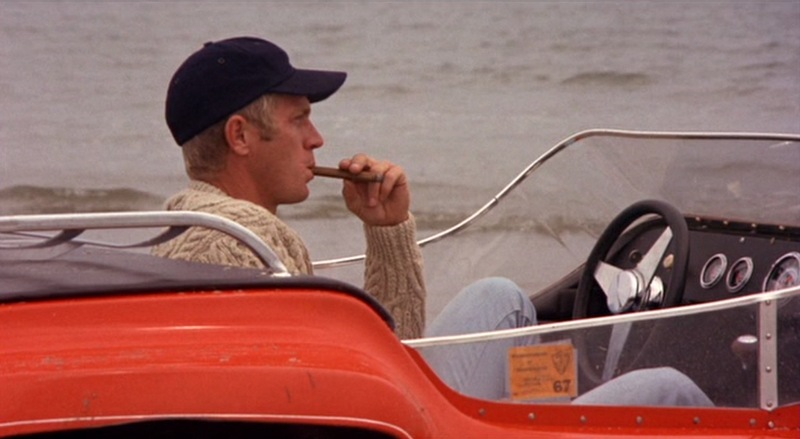 McQueen did all of is own stunts, reporting that “it’s very light” as he drove the thousand-pound vehicle all around the beach. Faye bravely sat beside the daredevil actor. 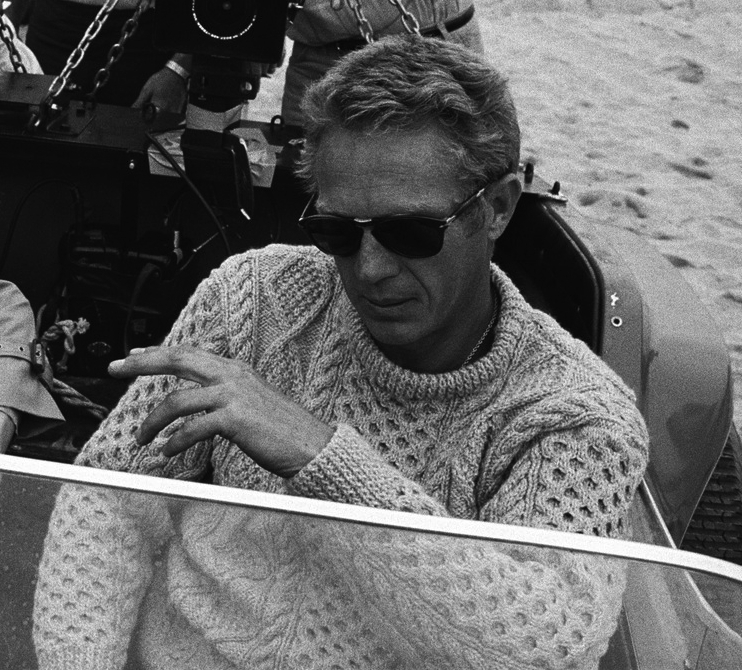 After the film’s completion, McQueen bought the dune buggy and sold it to a Manx dealer, who in turn sold it to its current owner in Hawaii. When not racing around the beach on his dune buggy, Crown relaxes with Vicki, drinking beer or red wine, depending on the time of day. The wine, which they enjoy in tin cups, is almost certainly unidentifiable but the gold-labelled beer bottles, seen in above photos, may yield some identification. Any idea what they might be? Something tells me McQueen wasn’t much of a wine snob. Crown’s beach look is best suited for a cooler beach, such as the Massachusetts beach featured in the film. A bulky sweater wouldn’t be the best idea when packing for the tropics. Very cool, Dave! Did you get to meet anyone involved in the film? Crewmen always have the greatest stories that no one ever gets to hear. Great to hear from you! Any idea what shoes he wore? 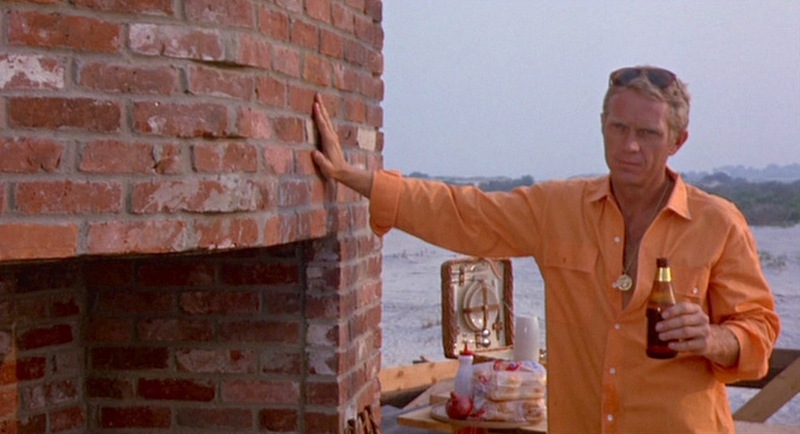 I know McQueen personally favored Converse Jack Purcells, which would work with his outfits.